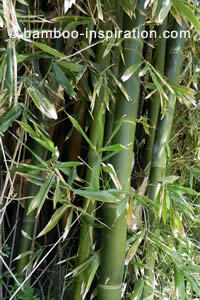 Phyllostachys edulis bamboo is one of the largest temperate hardy bamboos to choose from. Perhaps you may recognise it as called Moso bamboo, known as being common throughout China where it grows in huge forests and is a giant timber bamboo harvested for all kinds of purposes and products. Although in demand due to the vision of beautiful bamboo forests, and a big cold hardy bamboo, in western countries it will not grow to the same proportions as it does in countries of its native habitat. In fact, within a country such as the UK you’ll find a wide variation in how large P. edulis will grow, tending to appreciate mild and warm microclimates of specific regions such as Cornwall, and not grow so well in other less well matched climates. Phyllostachys edulis (pubescens) is a moderately spreading clumping bamboo that makes a good single specimen plant, bamboo grove, or even a forest if you have space to grow a bamboo forest. The height and width ranges given are however, completely dependent on the health of the plant and climatic conditions. For example, you may see it achieve a height of 8m with 8cm culms if you happen to live in a microclimate suitable for this big bamboo to thrive, but it’s unlikely to get bigger than that. Minimum to maximum height: 4-20 metres (13-65'). 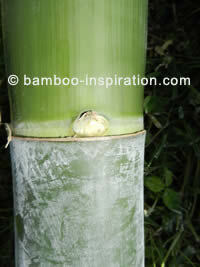 Identification of Phyllostachys edulis bamboo can partly be done through the recognisable new culms that are a sort of grey green colour with a white powdery covering. Older culms turn to a pale yellow-green on maturity. Dark reddish brown and spotted sheaths make visual appeal through colour contrast against the culms. 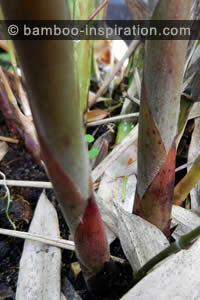 P. edulis is another giant size bamboo with small leaves in comparison to its size. I prefer smaller leaves because they provide a screen, a buffer for windy days, and yet do not create too much shade as do larger leaved species. ‘Moso’ has a high and relatively short branching habit. If you can protect young shoots from the effects of unpredictable late harsh spring frosts and extreme cold winds it will help them survive. P. edulis is big enough for a grove, hedge, screen, or a solitary specimen. The harvestable culms of Moso bamboo are widely used in Asia and exported worldwide for structures, building, and manufacturing products. The strong poles can still be harvested in countries where they don’t grow quite so huge, not big enough for timber, but none the less are suitable as a manufacturing material. If you did successfully grow a small forest you could harvest mature culms and sell the poles but that would be some years away from planting.